winery architecture and design surveys a range spaces from around the globe, looking at contemporary projects and the diverse materials and unconventional forms employed in their construction. 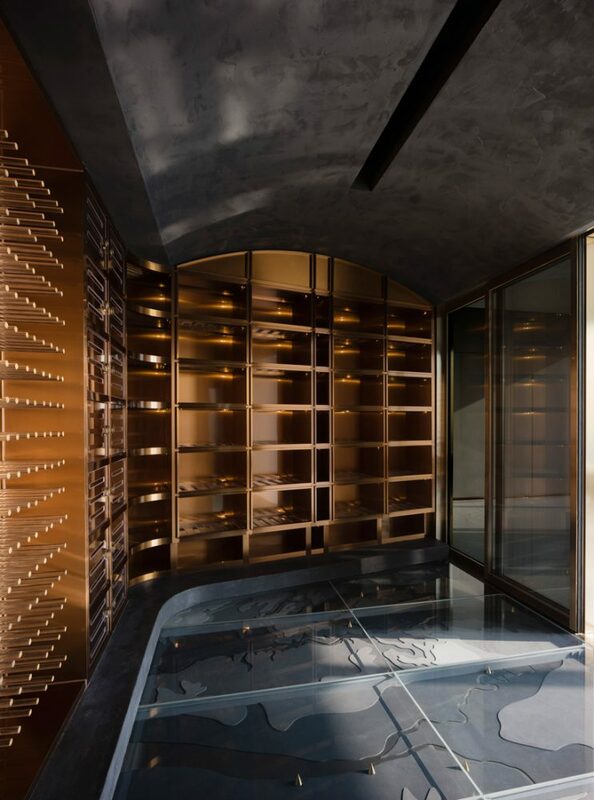 superimpose architecture has designed an exclusive members club and hidden wine cellar for a wine enthusiast. 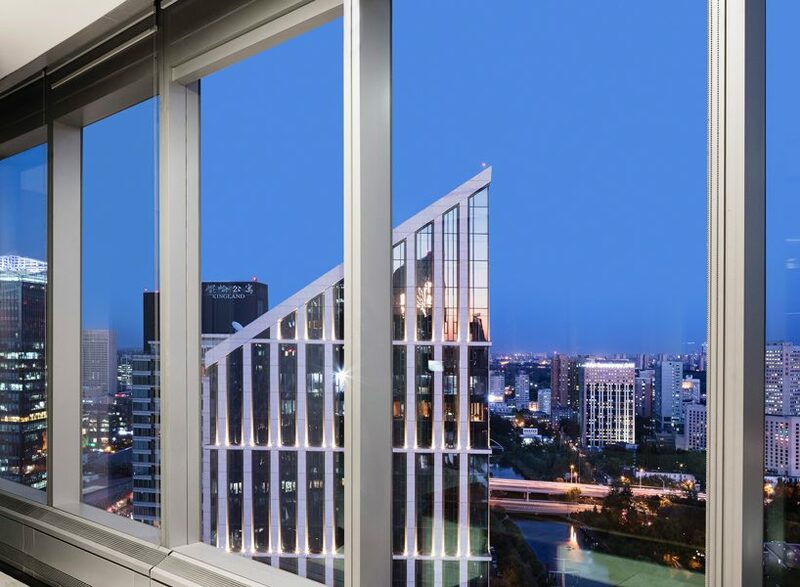 the project is situated at the top floor of one of beijing’s latest and most high-end tower developments, the genesis community. genesis beijing is a mixed-use development combining a hotel, offices, gardens and a museum by japanese architect tadao ando. the member’s club will only be accessible to a private and selected group of members. the member’s club is where the client organizes gatherings and stores and consumes his valuable wine and tea collection. 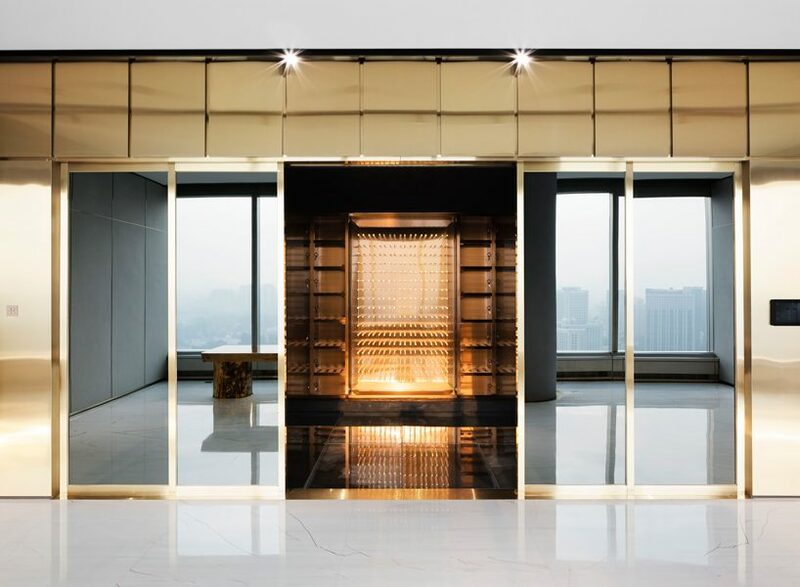 chinese based design studio superimpose architecture‘s project is divided by a central element creating two distinctive worlds: the client’s office space and the private club. 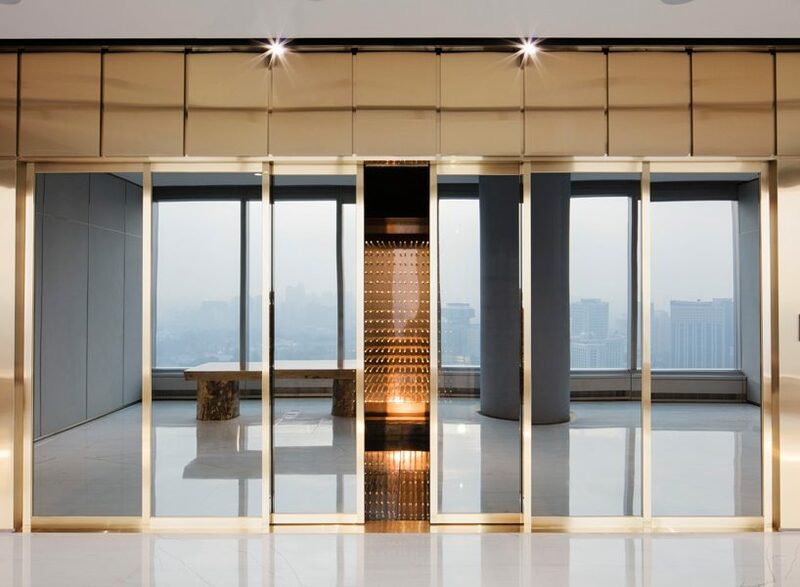 associates enter through a hidden pivot-door into the exclusive club that instantly offers spectacular views over beijing’s embassy and financial districts. 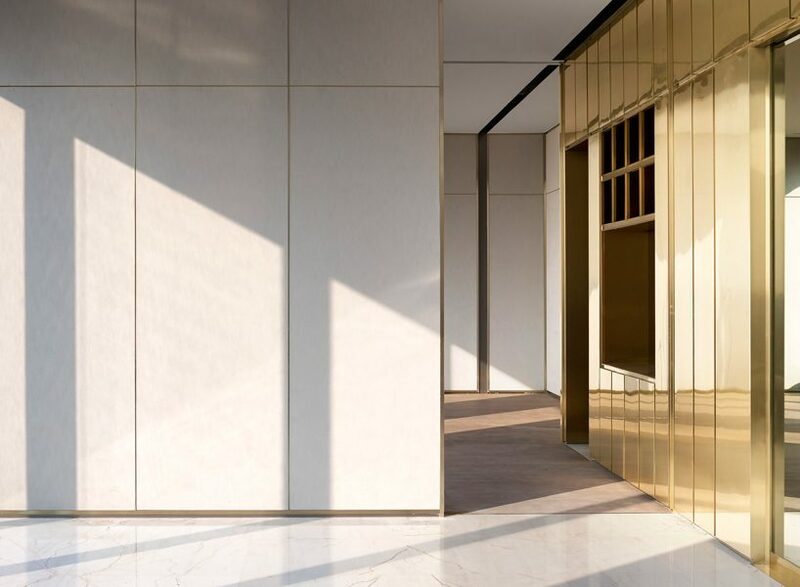 the golden stainless steel central element subtly reflects the skyline and naturally forms a backdrop of the entire member’s club. 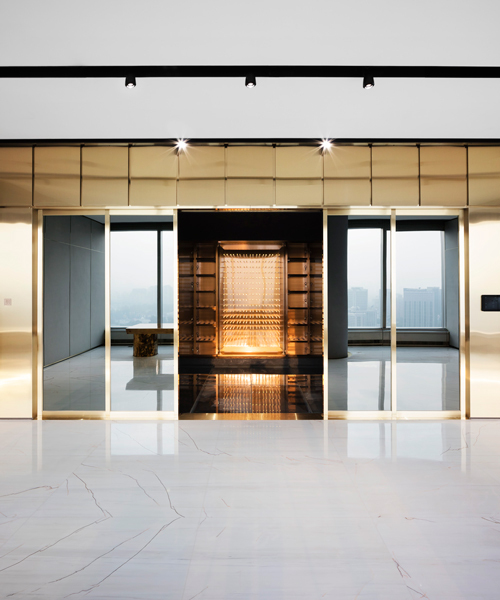 a segment of the central divider is constructed with dark-mirrored glass which reflects the skyline and hides the ‘sky cellar’. this piece has been designed to be a reinterpretation of the traditional wine cellar. 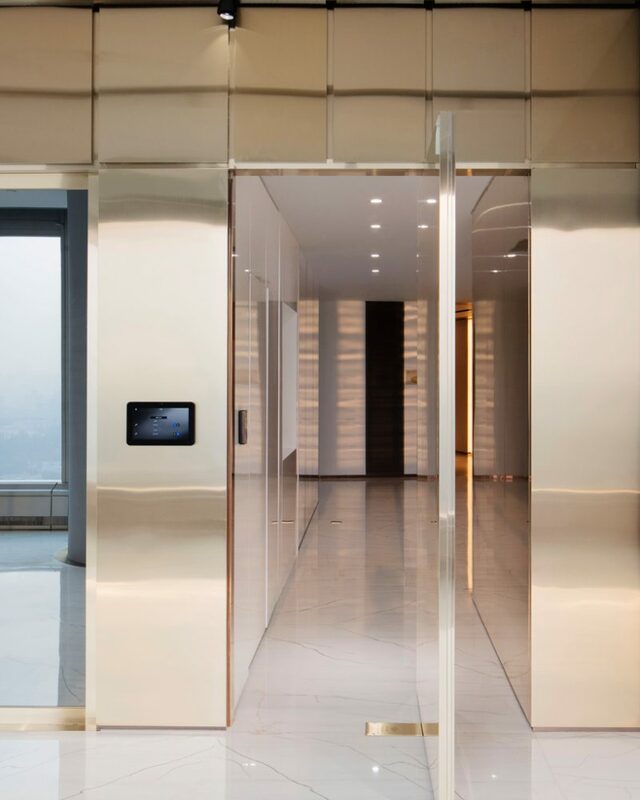 members access the hidden exclusive area through the automated sliding glass doors. 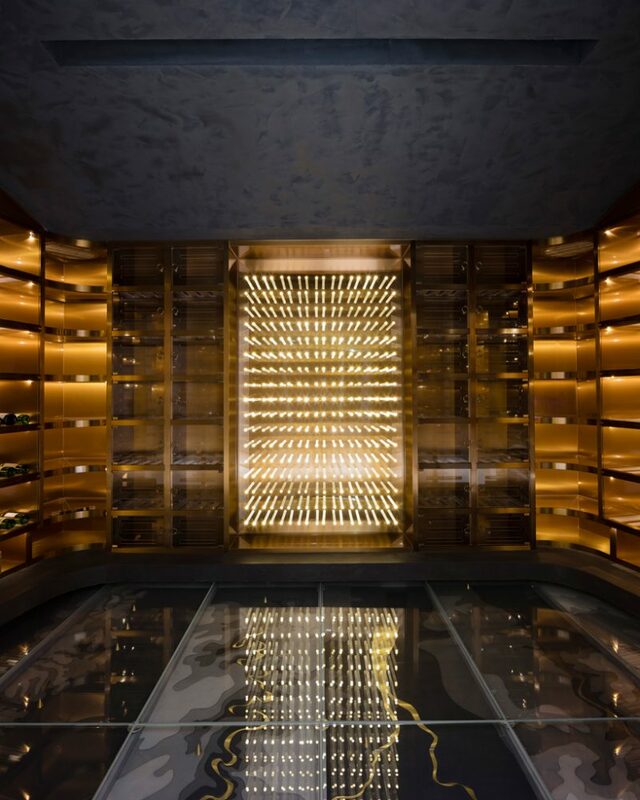 the 25 sqm cellar stores up to 500 bottles of wine from six famous regions around the world — bordeaux, rhone valley, burgundy, napa valley, mosel and barolo. during day time, the mirrored glass doors hide the wine cellar and protects it from direct sunlight. the mirror doors allow members to admire both the wine and skyline whilst being inside the cellar. at sunset and during evening hours, it lights up and reveals the 500 wine bottles to the main space. 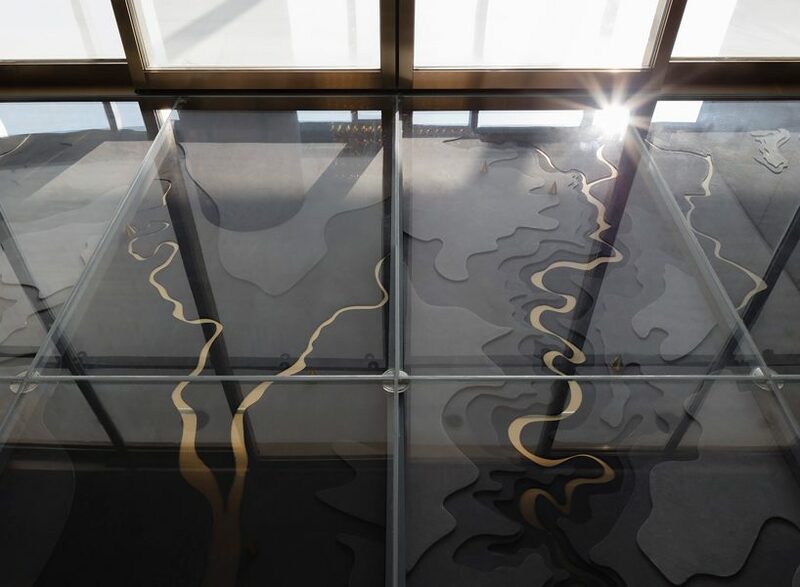 an abstract representation of the six wine regions is installed underneath a glass floor with automated light. superimpose architecture has designed the maps and constructed them by using concrete ash mud for the topography and stainless steel for the rivers. 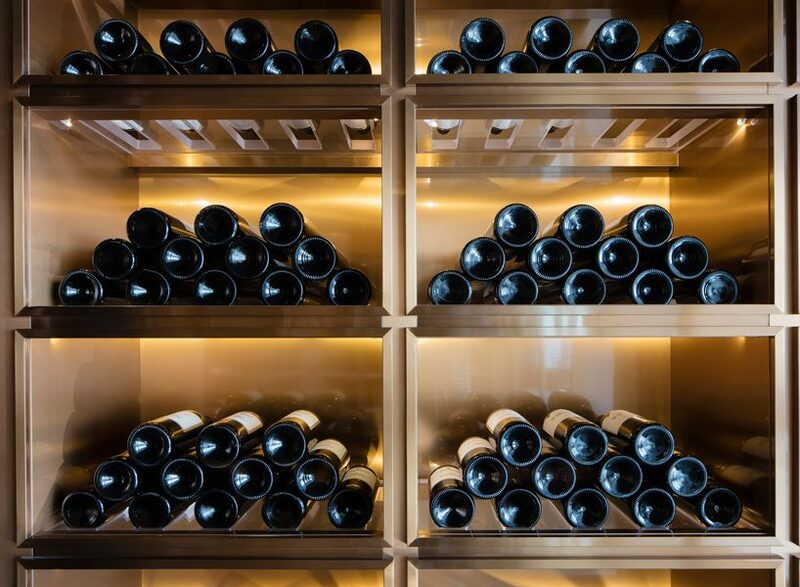 within the stainless-steel shelves, an acrylic base is being used and designed in such a way that it allows for multiple storing positions of the wine bottles. bottles can be displayed and stored either stacked or inclined to display the bottle etiquette. at the same time the acrylic base allows for an optimized light distribution inside the wine cellar.